It has been a week of historic endings and beginnings, most important of all today's handing over of Hong Kong to China. 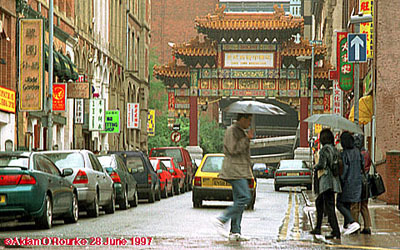 The occasion has local relevance as Manchester is home to one of the largest Chinese communities in the country, including many thousands of young Hong Kong Chinese people who come here to study at the city's universities and colleges. The area bordered by Portland Street, Princess Street, Mosley Street and Piccadilly Plaza has been transformed from a war-damaged warehouse district to a vibrant and exotic slice of China, right in the centre of Manchester. Walking through the Chinese Arch, sampling the restaurant menus, smelling the aromas from Chinese supermarkets and hearing the babble of Cantonese, you could almost imagine yourself in Hong Kong if it were not for the weather! But at 5pm today, just as the sovereignty of Hong Kong was being transferred to China, Manchester's Chinese district was quiet. The Manchester Evening News is developing its long-awaited website and today launches a new job-finding service. As you will see, there is still no news service, so this Newsletter remains the only regularly-updated source of news from Manchester. The local headlines this week have been dominated by two child murder cases. Ten days ago, the body of seven year old Suzanne Rarity was found in the upstairs bedroom of her house on Smalldale Avenue, next to Princess Road, overlooking Alexandra Park. She had been brutally assaulted and subjected to several hours of torture. On Wednesday, a man was arrested at Manchester Airport and has subsequently been charged with her murder. And on Tuesday, there was a television reconstruction of the last known movements of missing Openshaw boy Jamie Lavis. The item appeared on Granada TV's local "Crimefile" programme. A number of calls were received in response. The police were given a tip-off that the body of the boy was buried in a shallow grave in Boggart Hole Clough, near Blackley. The police then carried out a detailed search of the country park, which has continued up to today, but so far, no trace of the missing boy has been found. The parents are said to be clinging on to the hope they will see Jamie again, but the police are treating the case as murder. On Tuesday, local comedian and actor Eric Sykes was honoured by the Variety Club of Great Britain for his 50 years of service to comedy and to charity. And on Wednesday night legendary American singer Dionne Warwick gave a concert at the Bridgewater Hall, accompanied by the BBC Concert Orchestra. Also on Wednesday night, a charity dinner was held at the Piccadilly Hotel in aid of the Christie's Against Cancer Appeal. The £100-a-head event raised more than £2m for cancer research. In attendance were TV presenters Gordon Burns, Lucy Meacock and So Rahman, and Radio 1 DJ's Marc Riley and Mark Radcliffe. Donations came from a large number of firms, including British Aerospace, which gave £125,000, and North West Water, which donated £25,000. There have beren many television programmes to commemorate the first sighting of a UFO, which happened on the 24th of June, 1947. ITV featured a series of items, culminating in a one and a half hour special, during which a phone vote was held, in which a worrying 94% of callers said they thought the earth had already been visited by aliens. One of the best-known UFO researchers is local resident Jenny Randles, who appeared briefly on the ITV special, and is the author of many books on the subject. The local angle to this story is the reputation of the North West for sightings of unidentified flying objects, especially the skies over Lancashire, though there have been few recent stories. It's over two years since the Manchester Airport UFO incident and over recent months UFO sightings have been few and far between. Reports of sightings tend to be more frequent near air bases and aircraft factories, of which there are several in the area, including British Aerospace at Warton, Lancashire and at Woodford, Cheshire. Perhaps the sightings are of secret aircraft being test-flown. And on to transport of a more down-to-earth nature - my prediction about the price of the new Stagecoach weekly pass proved to be not quite accurate. Notices have appeared on Stagecoach buses announcing the new ticket, and the price was given in big letters as £5, unchanged from before. This however is only for a limited period, as passengers learn by reading the small print at the bottom of the notice. The normal price of the ticket will be £6, starting later in the year. Still very good value, but couldn't they have been more honest with the travelling public? The ticket allows holders to ride on the buses of Stagecoach Ribble, in addition to those of Stagecoach in south Manchester. The Ribble Bus Company was in the news 50 years ago last week, when a strike threatened to cause chaos and misery for Lancashire Wakes Week holiday makers. Read about it in Manchester Eyewitness. As Hong Kong was handed over to China, the monsoon rains there poured down all day. It's been doing something similar here in the past week or so, though without the tropical temperatures and humidity! A large area of low pressure continues to sit over the eastern part of the country, drawing cold winds down from the north on the western side. In the middle of the week temperatures fell to around 55 degrees fahrenheit, 13 degrees celsius, though they had risen by the weekend. Saturday, and part of Sunday were wet and overcast, though the sun appeared through the clouds on Sunday afternoon. Monday the 30th of June is cool and cloudy.